The following is an excerpt from the Career Paths that have been published by our Human Resources Department. If you need further information, you may contact us at 843-987-8073. Customer Service is critical to the success of any business that deals with customers. Strong customer service can build services and visibility as we distinguish ourselves as a world-class utility. The Customer Service Department is composed primarily of Customer Service Representatives and Meter Readers. 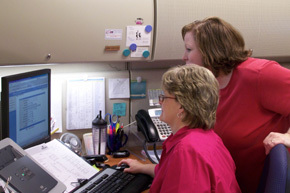 Customer Service Representatives interact with customers to provide information in response to inquiries about services. They handle and resolve customer’s concerns, assist individuals with opening accounts, accept payments, gather information by phone or in person and receive orders for services to be installed, turned on, turned off or changed. 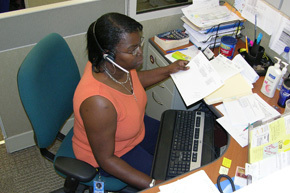 Customer Service Representatives use multi-line telephones, fax machines and personal computers. They also may resolve billing concerns and explain how to navigate the Internet site to make payments, sign up for services and receive general information. Meter Readers read water consumption meters and record the volume used. They serve both residential and commercial consumers, either walking or driving along a designated route using mobile interrogators. Their duties include inspecting the meters and their connections, turning service on or off, making repairs and keeping track of usage and record reasons for any extreme fluctuations in volume. Customer Service Representatives work in areas that are clean and well lit. They spend much of their day talking to the public in person or on the phone. And because they usually share the same workspace, it may be crowded and noisy. Their work may be repetitious and stressful when trying to service the needs of a difficult or angry customer. They may be exposed to a video display terminal for long periods of time. Meter Readers usually work outdoors in all types of weather as they travel through communities and neighborhoods taking readings. All employees normally work a standard 40 hours a week, Monday through Friday. People who work in engineering are interested in design, construction and/or repair. Areas of application can be varied, ranging from water and wastewater treatment systems to pipeline pumping and gravity sewer systems, to electrical power and control systems, as well as a number of other tasks. Engineers directly manage project designs, development and permitting activities for capital improvement and developer projects. They ensure all projects are on schedule and within established budgets. An inspector will perform, sometimes on a daily basis, inspections of capital improvement and private developer projects. They are responsible to ensure all projects are completed per designed plans and specifications. The geographic information system and mapping technicians perform analysis on spatial data sets, integrate multiple data sources and create thematic maps. They also collect field data to ensure the accuracy of the record drawings, working with AutoCad computer drafting software and sophisticated global positioning system (GPS) equipment. Workers in the Engineering Department work at least an eight-hour day, five days a week and may spend time both indoors and outdoors. Some may be exposed to hazards from equipment, chemicals or toxic materials. They can spend a considerable amount of time planning, analyzing data, preparing reports, maps and utilizing various computer applications. Work on holidays or overtime is not routine, but may be required. The Field Operations employee is part of a multi-skilled workforce responsible for a myriad of activities associated with the delivery and collection of water and wastewater. The employees schedule and manage all new connections to the water/wastewater systems, maintain and repair pipelines, lift and pump stations and insure construction meets local, state and federal compliance. They perform site restorations, minor concrete and asphalt repairs and install service lines utilizing basic hand tools, power equipment and a variety of equipment including backhoes, front-end loads, vacuum trucks and tractors. 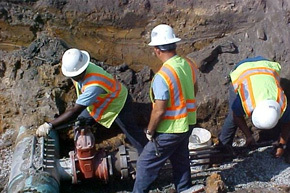 They also perform basic pipefitting, install or repair sewer laterals, remove blockages and perform service taps on a main line. They utilize maps, digging tools and magnetic locator compass to locate and mark utilities to prevent damage by excavation. They provide written data on measurements and sketches of line locations to assist with geographic information updates. They monitor and maintain the amperage, electrical phasing, float switches and other electrical components of pump stations. They conduct basic landscaping duties on the water system source, work together in a team environment and receive, respond and resolve customer concerns. Field Operators must frequently lift heavy equipment or tools, stand for long periods and sometimes work in uncomfortable or cramped positions. They need physical strength as well as stamina. They are subject to minor injuries such as falls, cuts from sharp tools, insect bites and muscle strains. They also work outdoors, sometimes in inclement weather. They generally work a standard 40-hour week, may have to work evenings, weekends or holidays as well as being on call. Almost every firm, government agency and business has employees from the financial, purchasing and warehouse career field. The water and sewer industry is no exception. Financial employees oversee the preparation of financial reports that summarize and forecast the utility‘s financial position. They implement cash management strategies, prepare special reports required by regulatory authorities and oversee the accounting, payroll and budget functions. The role of the financial employee is changing in response to technological advances that have reduced the amount of time it takes to produce financial reports significantly. They now perform more data analysis and use it to offer business leaders ideas on how to maximize financial strength. Purchasing obtains the highest quality merchandise at the lowest possible cost for their employer. They determine which commodities or services are best, choose the suppliers of the product or service, negotiate the lowest price and award contracts that ensure the correct amount is received at the appropriate time. Warehouse employees provide a link between manufacturers and the workforce. They pick up, transport, store and sometimes deliver a variety of equipment, parts, supplies and other necessary goods. They are responsible for logistical services including inventory control and management, order entry and fulfillment, labeling, light assembly and computerized inventory information. Financial employees work in comfortable offices, often close to top managers and with departments that develop financial data. They typically have access to state-of-the-art computer systems and information services. They commonly work long hours, often 50 to 60 hours per week. Purchasing employees work in similar conditions and often under great pressure. They usually work more than 40 hours per week because of business deadlines. Warehouse employees usually work indoors, though they may do occasional work on forklifts outside. They average over 40 hours per week and on some occasions exert heavy lifting and other physical labor. Every business, regardless of its size, must concern itself with basic people-related issues, such as safety, benefits, compensation, recruitment, retention, discipline, performance and relationships. Many times these businesses are of a size to restrict close contact between owners or top management and employees, so Human Resources and Safety professionals provide that link. Human Resources oversees the hiring and separation of employees, investigates and resolves employee concerns, handles the company’s employee benefit program, ensures fair and equitable pay rates, develops personnel programs and policies and a myriad of related functions. Safety promotes occupational health and safety within businesses by developing safer, healthier and more efficient ways of work. They help keep the workforce safe and workers unscathed. They analyze work environments and design programs to control, eliminate and prevent disease or injury. If an incident occurs, they help investigate unsafe working conditions, study possible causes and recommend remedial action. Both the safety and human resources professionals juggle these tasks and, increasingly, consult top management regarding strategic planning. They have moved from behind-the-scenes staff work to leading the company in suggesting and changing policies. Human Resources work usually takes place in a clean, pleasant and comfortable office setting. The normal work week is 40 hours per week, but may extend in some instances. And some travel may be required. Safety jobs often involve considerable fieldwork and some travel. The normal work week is often long and may include irregular hours. They may experience unpleasant, stressful and dangerous working conditions. And they may find themselves in adversarial roles as they change practices and business cultures. Water and wastewater treatment plants depend on complex machines, equipment and sophisticated systems to produce clean water for everyday use. Technical maintenance technicians perform various types and levels of maintenance on all these systems, and their components, ensuring their efficient non-interrupted operation. The technical maintenance specialist performs mechanical, electrical, pneumatic, hydraulic and instrumentation maintenance on equipment at the water and wastewater plants, pump stations, wells, storage tanks and disposal sites. They plan, schedule and perform preventive and predictive maintenance, maintain structural aspects of buildings such as plumbing, lights, doors and install, maintain and repair any related system. The Fleet Maintenance technician performs preventive maintenance and repairs on all pipeline, construction and landscaping equipment, as well as all fleet vehicles. Their work has evolved from simply mechanical to high technology. They have developed into diagnostic, high-tech problem solvers. They use a variety of tools and equipment such as pneumatic wrenches, grinding machines, flame-cutting equipment, jacks, hoists, common hand-tools and various computers. Workers in Technical and Fleet Maintenance work both indoors and outdoors, and may be exposed to work that is sometimes strenuous. They may stand for long periods, fix some problems with simple computerized adjustments, frequently work with dirty and greasy parts and in confined spaces or awkward positions. They must follow strict safety procedures to avoid serious injuries. Technicians generally work a standard 40-hour week, although overtime, work on weekends, holidays and on-call may be required. The need for businesses to remain competitive has become a more pressing issue over the last several years. As a result, employers seek Public Affairs professionals to market their services and help clarify or justify their points of view on health or environmental issues to community or special interest groups. Public Affairs evaluate advertising and promotion programs for compatibility with the public relations efforts and serve as the eyes and ears of top management. They observe social, economic and political trends that might ultimately affect the business and make recommendations based on these trends. They produce internal communications and assist top management in drafting speeches, arranging media interviews and maintaining other forms of public contact. They manage all efforts in the areas of Community Affairs and Education by notifying the public of significant events, conducting media conferences and publication of various written documents such as newsletters and brochures. They perform such activities as project management conducting neighborhood meetings, open houses, tours of facilities and advisory community meetings. Public Affairs professionals have become crucial to overall business needs and have moved to key management positions within their organizations. Public Affairs is usually located in comfortable offices close to those of top management. Long hours, including evenings, weekends and holidays, are common and sometimes exceed 50 hours per week. Working under pressure is unavoidable when schedules change and problems arise, but deadlines and goals must be met. There may be substantial travel throughout the service area to meet with customers, special interest groups or government officials. Clean water is essential for everyday life. Wastewater Operators remove harmful pollutants from domestic and commercial liquid waste so it is safe to return to the environment. Wastewater travels through customers’ sewer pipes to wastewater treatment plants, where it is treated and returned to streams, rivers and oceans or reused for irrigation and landscaping. Operators control processes and equipment to remove or destroy harmful materials, chemical compounds and microorganisms from the water. They also control pumps, valves and other processing equipment to move the wastewater through various treatment processes, and dispose of the removed waste materials. They operate chemical-feeding devices, take samples, perform chemical and biological analyses and adjust the amount of chemicals in the wastewater. 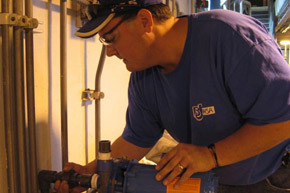 Operators use a variety of instruments to sample and measure water quality, and common hand and power tools to make repairs to valves, pumps and other equipment. They increasingly rely on computers to help monitor equipment, make process-control decisions, schedule and record maintenance activities and produce reports. They occasionally must work under emergency conditions and may work under extreme pressure to correct problems as quickly as possible. 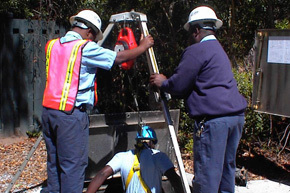 Wastewater Operators perform not only an essential, but critical function for their communities. They must work both indoors and outdoors, and may be exposed to noise from machinery and unpleasant odors. Their work is physically demanding and often is performed in unclean locations. They must pay close attention to safety procedures for they may be confronted with hazardous conditions, such as slippery walkways, dangerous gases and malfunctioning equipment. Wastewater plants operate 24 hours a day, 7 days a week; therefore operators work varying schedules and may include weekends and holidays. 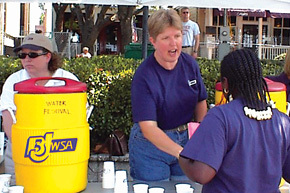 Water Operators treat water so it is safe to drink. They control treatment processes to remove or destroy harmful materials, chemical compounds and microorganisms from the water. 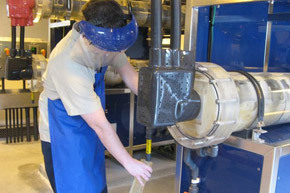 They control pumps, valves and other processing equipment to move water through various treatment processes. They operate chemical-feeding devices, take water samples, perform laboratory analyses and adjust the chemicals, such as chlorine, in the water. They use a variety of instruments to sample and measure water quality, and common hand and power tools to make repairs. They also make minor repairs to valves, pumps and other equipment. 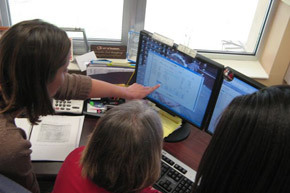 Water Operators rely on computers to help monitor equipment, store sampling results, make process-control decisions, schedule and record maintenance activities and produce reports. They are one of the first notified during an emergency response situation and respond to after-hours customer inquiries. Laboratory technicians test samples of raw materials or finished water products to make certain they meet industry and government standards, including regulations governing pollution. They perform analysis of certified parameters of finished and raw water, perform maintenance and repair on lab equipment, write bench sheets and insure the laboratory maintains governmental certification and licensing. Water Operators work both indoors and outdoors, and may be exposed to noise from machinery and unpleasant odors. They must pay close attention to safety procedures for they may be confronted with hazardous conditions, such as slippery walkways, dangerous gases and malfunctioning equipment. Water treatment plants operate 24 hours a day, 7 days a week; therefore operators work shifts, including weekends and holidays, on a rotational basis. 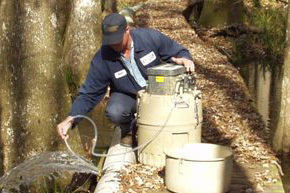 Laboratory technicians usually work in offices or laboratories, but occasionally may work outdoors while gathering water samples to test for pollutants. They may be exposed to hazards when handling certain chemicals, but there is little risk if proper procedures are followed. They generally work a regular 40-hour per week schedule, but may extend in some instances.